Black Tiger shrimp scientific name is panaeus monodon and sometimes it is referred as tigers have their own unique characteristic which easily can be noted by the black stripes encircled their shell. The head of the shrimp is composed by crucial organs, including the antenna while the walking legs as well as the swimming legs and the intestine placed along the abdomen or tail. The legs allow the tigers to walk and swim on the seafloor and sometime they like to move backward and forward. The female black tiger shrimp usually have bigger size than the male one which can grow up to 13 inches. 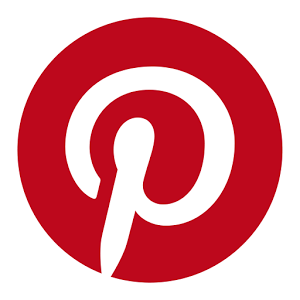 Learn more information regarding this species below. Black tiger shrimp scientific name is belong to the crustacean species which can be found in sandy or muddy sea bottom at the depths of 65 to 170 ft. This shrimp like to swim in tropical waters and can be found in so many countries, no wonder that tigers is one of the most popular shrimp species sold and distributed in the world. 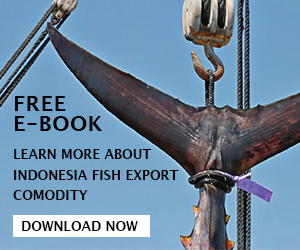 However, due to the high market demand, more than 80 percents of black tiger shrimp offered in the market is farmed predominantly in Asian countries such as Indonesia, Thailand, and so on. 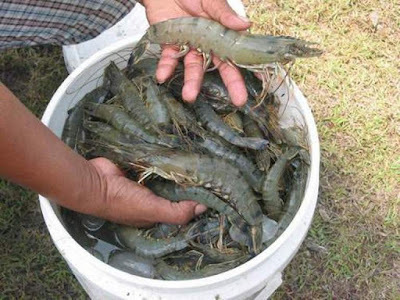 It is a very popular shrimp species as aquaculture and for export import trade. 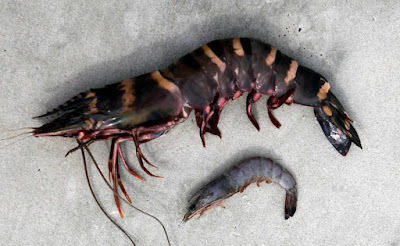 There are 2 different black tiger shrimp types; the first one is the tiger with usual black eyes while another has unique orange eyes. Black tigers orange eyes shrimp can be sold in higher eyes than the normal black eyes shrimp and in Japan such species called black diamond prawn or shrimp, although in fact it is just the same black giant shrimp. Shrimp is always known to have short lifespan and the Black Tiger shrimp is even reported to be difficult to cultivate or breed and kept alive. And this is why the giant tiger shrimp is really high in price compared with other shrimps. Moreover, the black tiger shrimp has different grades and the grading is depends on the eyes color and the solidity of the black coloration meaning that less solid black color will have cheaper price. 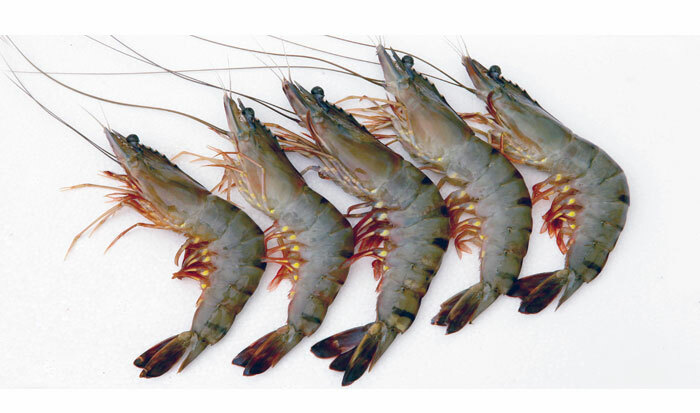 The Black Tiger shrimp is one of the most famous species to be sold in international market. The largest producers can be found mostly in Asian countries since they conduct black tiger shrimp farms to stock market demand all around the world. The issue with farmed shrimp is that the contamination from possible chemical and antibiotic matters. 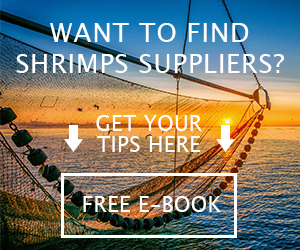 That’s why many large organizations recommend buyers to purchase shrimp that wild caught instead of farmed shrimp. 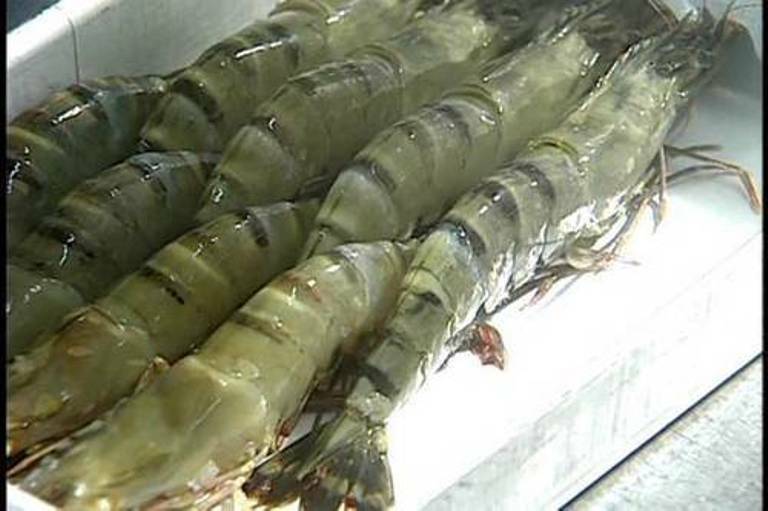 But, thanks to the high technologies and standards, today’s farmed black tiger shrimp can be controlled precisely and properly to prevent any diseases, bacterial, and other chemical contaminations that might happen. This is why, when consumers want to order the Black Tiger shrimp in shrimp suppliers or manufacturers, they need to ask the origin of Black Tiger shrimp. This is one of many ways to ensure that the shrimp is caught and cultivated properly plus sustainably. When you ask where the tigers shrimp comes from, it will allow you to search the origin country method used to cultivate or raises and harvested the shrimp. Moreover, you can also start to search whether the country follows proper rules and standards to ensure not only the safety, but also how they can manage to raise the shrimp in hygienic places. For your information, most of the farmed shrimp as well as the Black Tiger shrimp are usually raised in large ponds and tanks. 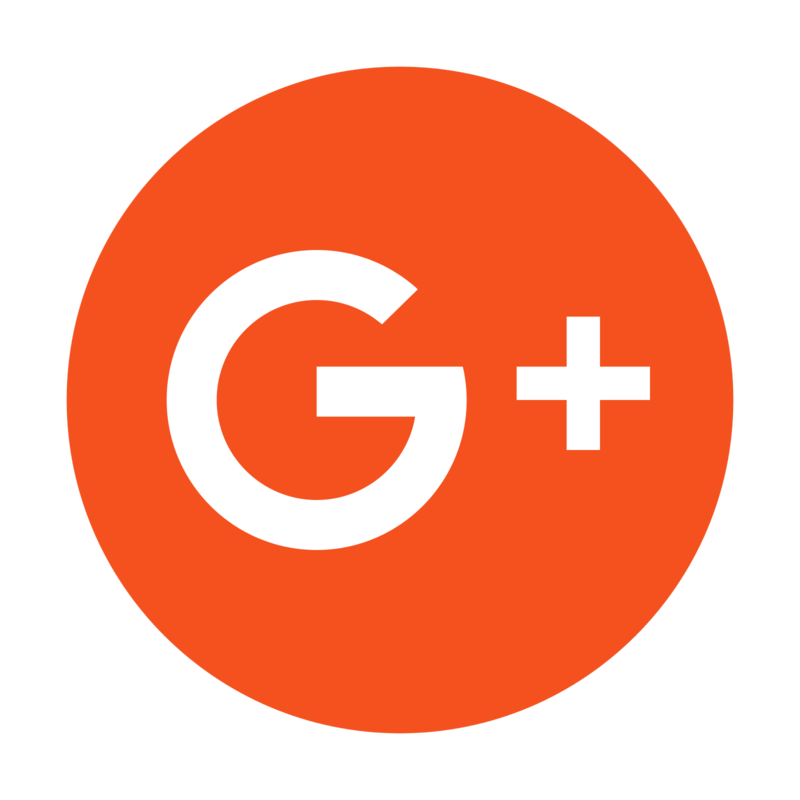 The problem with ponds and tanks are that they can accumulate bacteria and algae which can contaminate the shrimp so they have diseases and not ready to be consumed. However, if the farmers or manufacturers have high quality control then they can ensure the customers that their products are high in quality and sold in good condition free from any contaminations. Furthermore, you also need to check whether they have certificate from major organizations that ensure the safety of their Black Tiger shrimp. Hope above information regarding the Black Tiger shrimp scientific name and other essential information help you to understand more about this famous species.